Yoga Nidra is a guided relaxation practice that invites the practitioner to experience total mental, emotional, and physical relaxation, while remaining awake and aware. This meditation technique opens doors for deep inner healing and rejuvenation, provides methods for manifesting our hearts’ deepest desires, and awakens us to higher levels of consciousness. Yoga Nidra has healing effects on the many levels of Self, by connecting practitioners to their deeper layers of awareness and innate, internal power to self-heal. The deep-relaxation state induced by this practice strengthens the bridge between the conscious and subconscious minds, allowing one to sow the seeds of intention for a healthier, happier life during waking consciousness. Yoga Nidra has proven to be an effective treatment for insomnia, anxiety, stress, depression, addiction, and chronic pain. 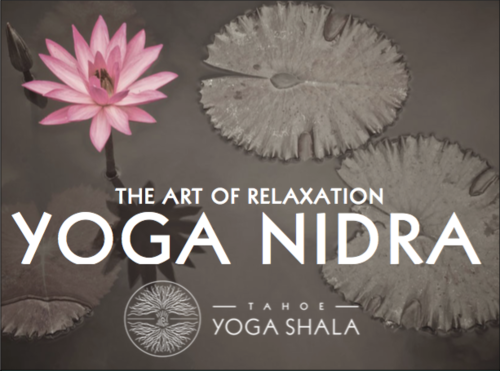 Come relax, release, and rejuvenate with Yoga Nidra!